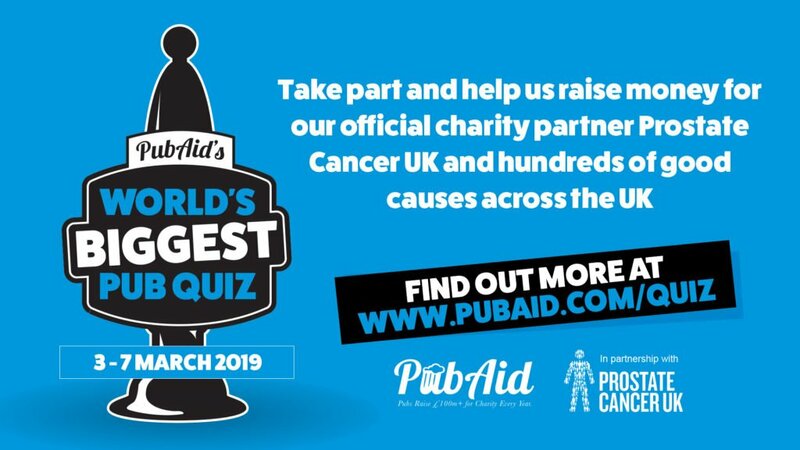 We are delighted to be supporting the fourth annual World’s Biggest Pub Quiz alongside PubAid and Prostate Cancer UK as part of their efforts to raise vital funds and awareness to help combat one of the UK’s biggest killers of men. 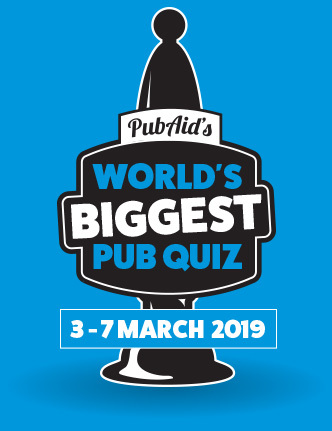 The concept is simple – pubs and bars all over the country host a quiz night, all materials for which are provided by PubAid, with customers paying to enter. All profits are then donated to Prostate Cancer UK, or the host’s chosen charity, or both! More than £400,000 has been raised as a result of the World’s Biggest Pub Quiz in the last 3 years, with over £190,000 of that coming from last year alone. So between the 3rd and 7th March 2019, PubAid are looking to break this record and raise even more – and every little helps! Find your nearest participating venue, here! If you are or know of a pub that would like to take part, outlets can sign up here. It only takes a couple of minutes and will provide a great night for pubs and punters alike – and all for a great cause, too. PubAid was formed in 2009 with the aim of highlighting the great work done by UK pubs, which includes raising more than £100m every year for hundreds of charities. They are a working party made up of directors and volunteers, who seek to gain greater appreciation by the media, politicians and other stakeholders, for the positive contribution made by the Great British Pub in local communities across the country. A survey by PubAid found that pubs have contributed more than £100m to charities every year, with 77% of pubs surveyed taking part in some form of fundraising. As a result, more than 2000 charities have benefited from the work of pubs and bars. Beginning life as The Prostate Cancer Charity back in 1996, formed by Professor Jonathan Waxman with the aim to improve the care and welfare of those affected by prostate cancer, increase investment in research, and raise public and political awareness of the disease. In 2012 they merged with Prostate Action and re-branded to form the charity as we know it today. Many of you will recognise the Prostate Cancer UK’s work from high-profile campaigns supported by the likes of; Jeff Stelling and the gents of the Soccer Saturday panel, Bill Bailey and his Men United movement, and Ray Winstone in the award-winning Father’s Day film. As a result of their efforts, Prostate Cancer UK have been able to invest over £37 million into ground-breaking research, and award-winning support.